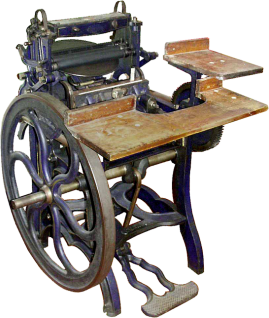 The Liberty platen job press was invented by Frederick Otto Degener of New York City, and patented by him in 1859 and 1860. Degener had worked for George P. Gordon as a draftsman, and left Gordon’s employment to develop, manufacture, and market the Liberty press. Initially the Liberty was offered in three sizes, a No. 1, 4×7; No. 2, 6×10; and No. 3, 10×15. Later the Model 1 was discontinued, the size of the No. 2 increased to 7×11, and a No. 2A, 9×13 and a No. 4, 13×19 were added to the line. Still later a No. 3A, 11×17, and a No. 5, 14-1/2×22 were added as well. Sometime between 1863 and 1865 Francis M. Weiler became a partner and the firm became Degener & Weiler. Degener died in 1873, and his son took his place in the partnership, but in about 1877 Weiler purchased Degener’s share of the business and the company name became F. M. Weiler and then Liberty Machine Works. After opening a manufacturing plant in Germany, Weiler closed the US manufacturing plant in about 1892 and after that year all Liberty presses were built in Germany. “The Liberty Press: a Platen Job Press Invented by Frederick Otto Degener” by Robert Oldham and Erik Desmyter, The Journal of the Printing Historical Society, New Series No. 10, 2007, pp. 23-44.